Stocks closed the holiday-shortened week mixed, with some sectors losing ground while others gained after a disappointing May jobs report signaled that the economy may not be strong enough for the Federal Reserve to raise rates this month. For the week, the S&P 500 ended flat, the Dow lost 0.37%, the NASDAQ increased 0.18%, and the MSCI EAFE added 0.13%. On Friday, we got a look at how the labor market did in May. Analysts looked to the report to see whether the labor market would give the Fed the ammunition it needed to move at the June meeting. Here are a few things we took away: Job growth disappoints…but it has happened before The economy created just 38,000 new jobs last month, the worst showing since September 2010. The number of new jobs sharply missed expectations, which called for around 160,000 new jobs. However, seasonal factors, like a massive Verizon worker strike, which took 34,000 workers out of the count, were at play and may have affected hiring numbers. The labor market has suffered temporary setbacks before. For example, in December 2013, the economy added a paltry 45,000 jobs; four months later, the economy gained 310,000 jobs. In March 2015, the labor market added just 84,000 jobs; in July, 277,000 new jobs were created. CHART1 Labor market trends may slow job creation The jobs report showed that the unemployment rate fell to 4.7%, the lowest since November 2007. However, much of the decrease occurred when jobseekers dropped out of the job search. As we approach full employment (some may argue that we’re already there), the effects of having fewer jobseekers begin to be felt by employers. Employers who are hiring may struggle to find qualified candidates due to skill mismatches, a problem that’s likely to continue to affect certain industries. These issues affect job creation in a “mature” labor market recovery. One industry expert projects that monthly job growth will average 175,000 for the rest of 2016. 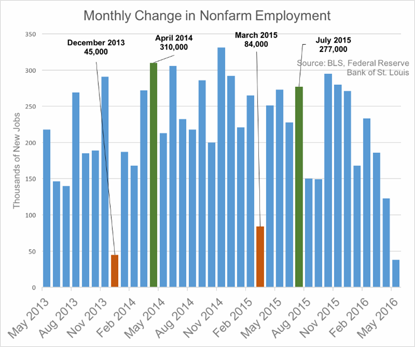 In comparison, monthly job increases averaged 251,000 in 2014 and 229,000 in 2015. Can the slower pace of hiring support the consumer spending the economy needs to grow? Perhaps, if wages continue to grow. Wages were up 2.5% in May as compared to a year ago, which is a better pace of growth than we have seen. Another measure of wage growth favored by economists, the Employment Cost Index (ECI), shows that wages were up 2.4% (year-over-year) in the first quarter. A third measure calculated by the Atlanta Fed shows a rosier 3.4% annual increase in hourly wages in April. You can bet that the Fed will be looking at all three measures when deciding if wage growth is strong enough to support consumer spending this year. The Fed may not raise rates in June The weak report also may have reduced the odds of a June interest hike by the Federal Reserve, though some analysts think that other positive economic indicators might give the Fed the confidence to act. 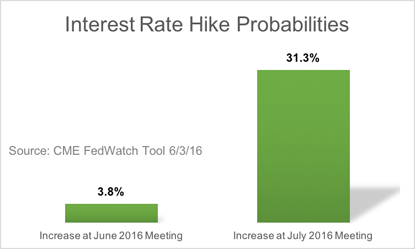 Right now, the market is pretty convinced the Fed won’t raise rates in June; one measure shows that the current market probability of a June hike is just 3.8%, while the probability of a July hike is 31.3%. Our view Overall, does the weak May jobs report signal weakness in the U.S. economy? Perhaps, though it’s far too soon to sound the alarm. Since other economic indicators like Gross Domestic Product growth, housing market activity, and personal spending all point to positive growth, it’s not likely that one weak report spells disaster for the economy. Rather than fixate on a single piece of data, it’s more important to look at overall economic trends. Looking ahead, we’re expecting investors to take stock of the dismal jobs report and perhaps hit the brakes on the three-month rally we’ve experienced. Summer tends to be a slow season for markets as many traders take time off and stocks can overreact to headlines. A small pullback in the weeks to come wouldn’t surprise us, though traders could also shrug off the report. While weak data always sidelines some investors, long-term investors should focus more on their goals and less on short-term market swings. As always, we’ll keep you updated. Investing involves risk including the potential loss of principal. No investment strategy can guarantee a profit or protect against loss in periods of declining values. Diversification does not guarantee profit nor is it guaranteed to protect assets. The Standard & Poor’s 500 (S&P 500) is an unmanaged group of securities considered to be representative of the stock market in general. The Dow Jones Industrial Average is a price-weighted average of 30 significant stocks traded on the New York Stock Exchange and the NASDAQ. The DJIA was invented by Charles Dow back in 1896. The Nasdaq Composite is an index of the common stocks and similar securities listed on the NASDAQ stock market and is considered a broad indicator of the performance of stocks of technology companies and growth companies. The MSCI EAFE Index was created by Morgan Stanley Capital International (MSCI) that serves as a benchmark of the performance in major international equity markets as represented by 21 major MSCI indexes from Europe, Australia and Southeast Asia. The S&P U.S. Investment Grade Corporate Bond Index contains U.S.- and foreign-issued investment-grade corporate bonds denominated in U.S. dollars. The SPUSCIG launched on April 09, 2013. All information for an index prior to its Launch Date is back-tested, based on the methodology that was in effect on the Launch Date. Back-tested performance, which is hypothetical and not actual performance, is subject to inherent limitations because it reflects application of an Index methodology and selection of index constituents in hindsight. No theoretical approach can take into account all of the factors in the markets in general and the impact of decisions that might have been made during the actual operation of an index. 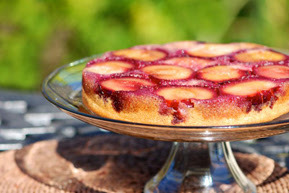 Actual returns may differ from, and be lower than, back-tested returns. The S&P/Case-Shiller Home Price Indices are the leading measures of U.S. residential real estate prices, tracking changes in the value of residential real estate. The index is made up of measures of real estate prices in 20 cities and weighted to produce the index. The 10-year Treasury Note represents debt owed by the United States Treasury to the public. Since the U.S. Government is seen as a risk-free borrower, investors use the 10-year Treasury Note as a benchmark for the long-term bond market. Opinions expressed are subject to change without notice and are not intended as investment advice or to predict future performance. Past performance does not guarantee future results. You cannot invest directly in an index. Consult your financial professional before making any investment decision. Fixed income investments are subject to various risks including changes in interest rates, credit quality, inflation risk, market valuations, prepayments, corporate events, tax ramifications and other factors. The Employment Cost Index (ECI) is a quarterly measure of the change in the price of labor, defined as compensation per employee hour worked. It is prepared by the Bureau of Labor Statistics. These are the views of Platinum Advisor Marketing Strategies, LLC, and not necessarily those of the named representative, Broker dealer or Investment Advisor, and should not be construed as investment advice. Neither the named representative nor the named Broker dealer or Investment Advisor gives tax or legal advice. All information is believed to be from reliable sources; however, we make no representation as to its completeness or accuracy. Please consult your financial advisor for further information. Featured Image Notes: All index returns exclude reinvested dividends, and the 5-year and 10-year returns are annualized. Sources: Yahoo! Finance, S&P Dow Jones Indices, and Treasury.gov. International performance is represented by the MSCI EAFE Index. Corporate bond performance is represented by the SPUSCIG. Past performance is no guarantee of future results. Indices are unmanaged and cannot be invested into directly.